This page covers Fitness Trackers basics, best Fitness Trackers manufacturers with features and benefits or advantages of Fitness Trackers. • Fitness Trackers come usually in the form of watches or wrist bands. • They are used for various measurements such as distance travelled,	sleep tracking, calories burned, heart rate monitoring, etc. • Modern fitness trackers are used along with smart phones in order to receive calls, reply to texts or emails, manage schedules etc. • They provide storage capacity in order to store information for further analysis. 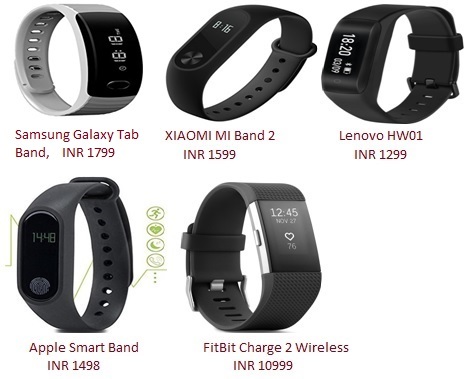 • With advancement of wireless technologies, fitness trackers are available with GPS, bluetooth, wifi and cellular connectivities. This makes them seamlessly connected with wireless devices at all the time. • The figure depicts some of the best fitness trackers from samsung, Xiaomi, Lenovo, Apple and Fitbit. • Fitness trackers store all day activities, reminds user to move and also provide battery status information in order to charge. They provide calender alerts for users to remind about useful events. Following table mentions best Fitness Trackers from popular manufacturers around the world. Following are the benefits or advantages of Fitness Trackers. ➨They are cheaper and non-invasive. ➨They are easy to use with touch of buttons using well designed apps. ➨They can be used for common sports activities at schools, colleges and work places. This makes large group analysis very cost effective. ➨The fitness tracker provides lots of information while you workout at home or at Gym such as calories burned, distance travelled, cardio level etc. Moreover it provides previous days information in order to track from its memory storage. This makes you motivated to do regular exercises. ➨The regular use of fitness trackers keep you hale and healthy. ➨Modern devices come with large OLED display screen which is very convenient to use. Refer advantages and disadvantages of Fitness Trackers >> for more information.